After Blackwater took out the first ever Queensland five-star tidy town accreditation earlier this year, more Central Highlands’ towns are celebrating wins in the Keep Queensland Beautiful – Tidy Town competition. The news comes after Keep Queensland Beautiful announced three Central Highlands’ towns and an Emerald business, Edison’s Burger Bar, as winners. Emerald picked up the Energy Innovation Award, Springsure took out the inaugural Destination Award, Capella picked up a ‘highly commended’ for heritage and culture and Edison’s Burger Bar picked up the Waste Warrior Award. Mayor Kerry Hayes said the awards are proof that the Central Highlands is a liveable region that has much to offer. ‘According to the assessors, Springsure could have received so many awards, it inspired the creation of the inaugural Destination Award,’ he said. Council’s CEO Scott Mason said he is grateful to council staff that welcomed Keep Queensland Beautiful assessors to the region. ‘There was an opportunity to have assessors tour the region and gather evidence to support the award submissions, he said. ‘Council staff in Emerald, Springsure and Capella invited the Keep Queensland Beautiful team and guided them through their itinerary, showing off what each town has to offer. 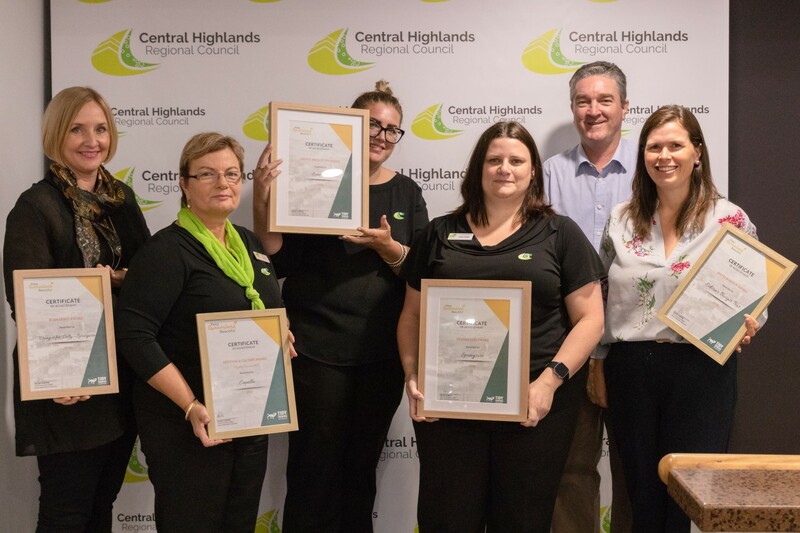 ‘As people of the Central Highlands we all can take pride in the awards and I sincerely thank our staff. Link to image. – Cr Gail Godwin-Smith, Area Support Officer Donna Rask, Acting Manager Customer Services Rebecah Brosnan, Area Support Officer Caasi Holiga, Mayor Kerry Hayes and Cr Megan Daniels.